Please present your iVenture Card or voucher at Snow City ticketing counter for your entry. Collection Information Please present your iVenture Card or voucher at Snow City ticketing counter for your entry. Snow City is Singapore’s first permanent indoor snow centre. It is a unique attraction for family fun, corporate team building, and educational tours. Snow City receives an average patronage of some 130,000 visitors from around the world each year. The lure? 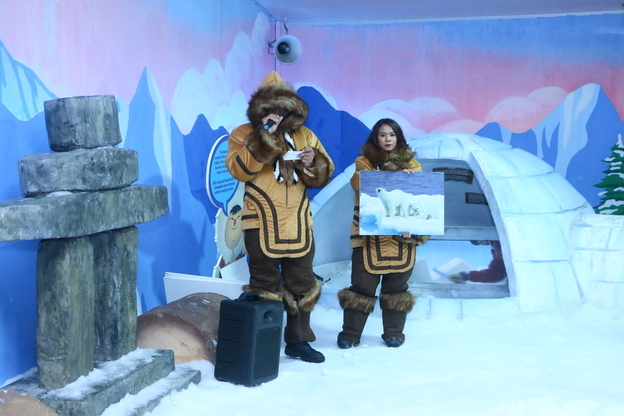 A snow chamber that delivers real snow experience all year round; a unique sub-zero environment that will elevate your corporate events and team building sessions to greater heights; and snow professionals that create not only fun and enriching educational programmes, but magic out of thin air as well! The Snow Chamber has a three-storey high and 60-metres long snow slope for visitors to snow tube! It is constantly being maintained at -5°C with a snow depth of 400 mm. This snow destination is popular not only among Singaporeans but also among tourists, especially from neighbouring countries here in Asia who are unable to experience subzero temperatures in their own homes. Watch out for daily impression programs such as the snow fall and snow blizzard experience. Snow City encourages guests to bring their own winter apparel. However, jackets and boots will be provided as complimentary for every admission ticket purchased. Wearing of long pants is compulsory to keep you safe and warm inside the subzero temperature of the snow chamber. Gloves and waterproof pants are optional for rent. Wearing of socks is required for hygiene purposes. Socks are also available for purchase. Personal cameras are prohibited in the snow chamber. Please approach the photographers for assistance. Best time to visit would be morning or late afternoon to avoid the peak period. Watch out for daily impression programs such as the snow fall and snow blizzard experience.